Library Anywhere now includes the ability for any library to translate or edit any of the English text into whatever language they like. Libraries can even choose to have multiple languages and link between them—one in Spanish and another in English, for example. You can also use this for simple fixes, like changing the default text in the Search box from “Search” to “Search catalog” or even “Search catalogue”. Directions on how to get started translating or editing your Library Anywhere are here. Email me (abby@librarything.com) with any questions about any Library Anywhere, or how to enable translation for your account. To subscribe, contact Peder Christensen at Bowker—toll-free at 877-340-2400 or email Peder.Christensen@bowker.com. We’ve recently added a series of improvements to the LibraryThing for Libraries OPAC enhancements, in an attempt to make them more useful and friendly to a non-English audience. We’ve recently added the ability to let libraries translate the entire interface of the LTFL enhancements. All the text in the reviews lightbox, for example, or in the tag browser. 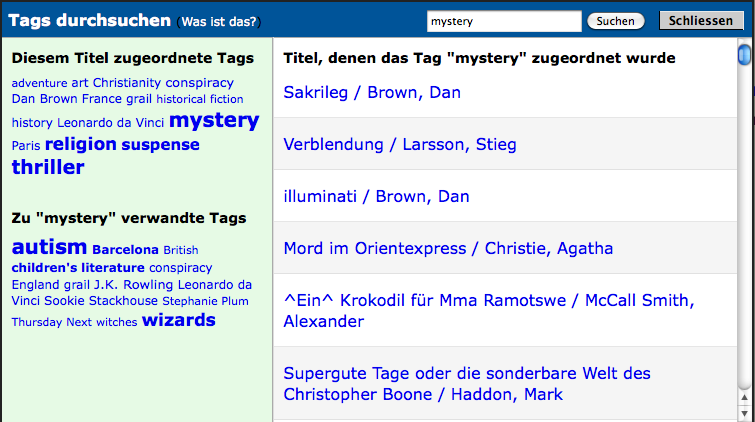 See the below screenshot of the tag browser in a German library. To use the translation feature, log into your LTFL account and click the Enhancements tab. Click on “Edit/Translate Interface” under the Configure section, and start translating! When multiple editions of a work are available at your library, LibraryThing for Libraries picks the most popular edition. We’ve just added the ability to preference certain languages. This lets you, for example, pick a less popular German edition over a more popular English one. In the screenshot above, note that it’s pointing to “Sakrileg” by Dan Brown (instead of the English edition, “The Da Vinci Code”). To enable language preferences, log into your LTFL account and click the Enhancements tab. Then navigate to Global configuration, and scroll down to the new field titled “Edition language preference.” Here you can enter a comma-separated list of MARC language names (e.g., ger, fre) that will control which edition of a work is displayed. About LibraryThing for Libraries: LibraryThing for Libraries (LTFL) is a system of OPAC enhancements, designed to make your OPAC more engaging and informative. LibraryThing for Libraries enhancements include Tags, Reviews, Similar Books, Shelf Browse, Series, Awards, Lexile measures and Other Editions. We also offer Library Anywhere, a full-featured mobile catalog and website for any OPAC. To subscribe to LibraryThing for Libraries, contact Peder Christensen at Bowker—toll-free at 877-340-2400 or email Peder.Christensen@bowker.com. If you already subscribe to one of the LTFL enhancements and would like some help configuring translation settings, email abby@librarything.com.